I’ve spent the last few days preparing the warp for the color study – winding the bouts and tying them off every 24 inches to get the synchronized color changes necessary for the study. I thought my process of synchronizing the ties might be useful to others, so here it is. 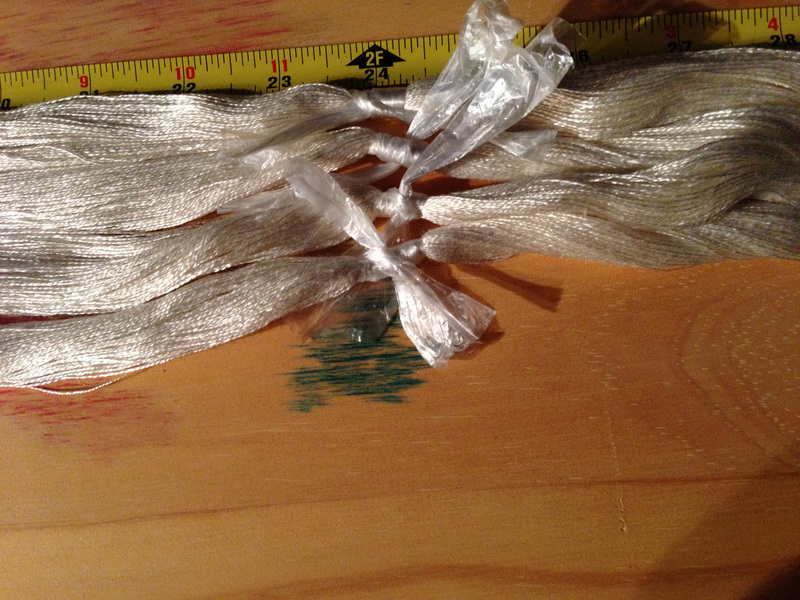 The roll of plastic and the thin strips of plastic are ikat tape, intended for tying off warps for ikat weaving. I acquired it by way of a fellow weaver who had had it in her stash for ages, but got it from another weaver who…you get the idea. But I believe Maiwa Handprints in Vancouver sells it. I’m using it experimentally, to see if it works better than the artificial sinew (available from Dharma Trading Company) I was using before. Anyway, the next step was to start tying off the individual bouts with the ikat tape. Three loops around the bout, pull to tighten, tie in a half-knot. The plastic seems to hold to itself well enough that a full knot isn’t necessary. Presto! Nicely aligned ties, placed exactly 24″ away from the previous ties. 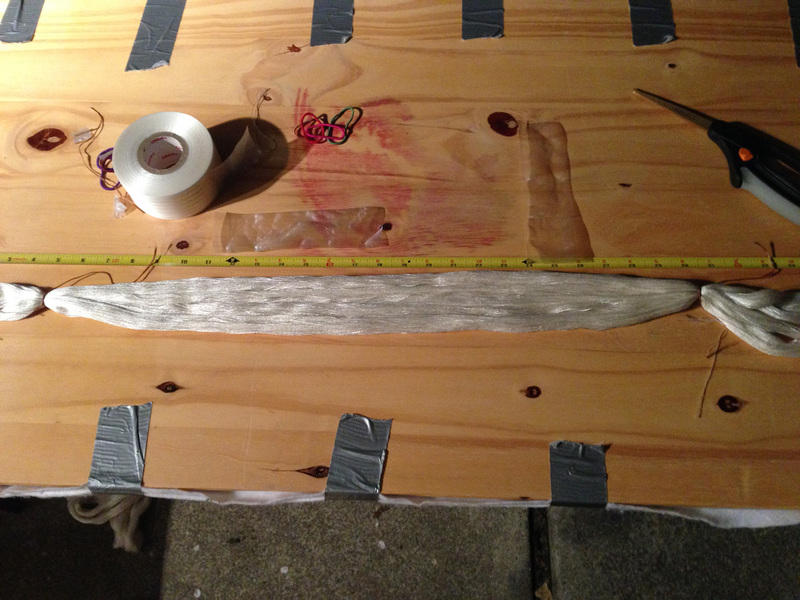 I then stretched and bound the next section, keeping the ties that align the bouts tight until the next section was aligned and tied. Using this method, I’ve synchronized color changes across a 13-yard warp with no more than an inch or two of shifting at the end. Of course there is some waste at the changeover between colors – but much less waste than if I had wound 17 separate warps to test the color combinations! Having finished tying off the warp, I’m now working on winding the skeins for the weft. 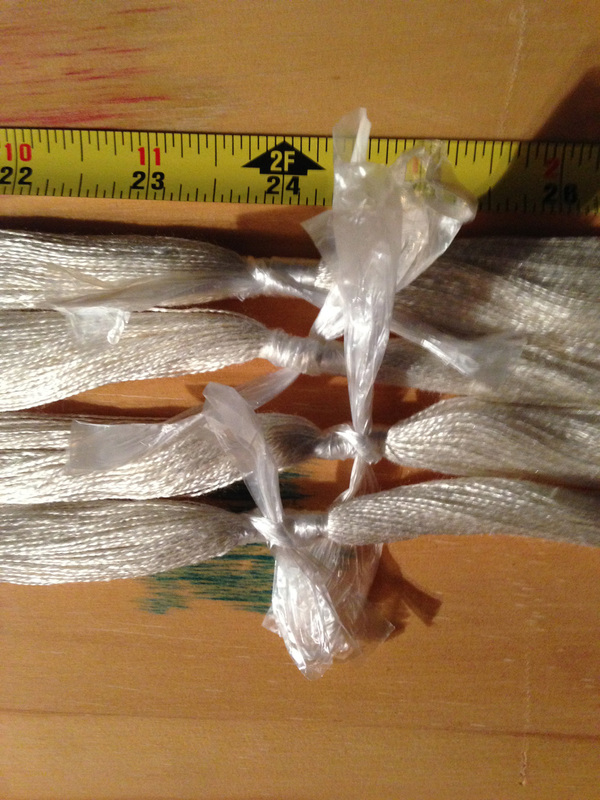 I decided on winding skeins rather than knitting blanks, as I’m using 25 grams of yarn per weft color. 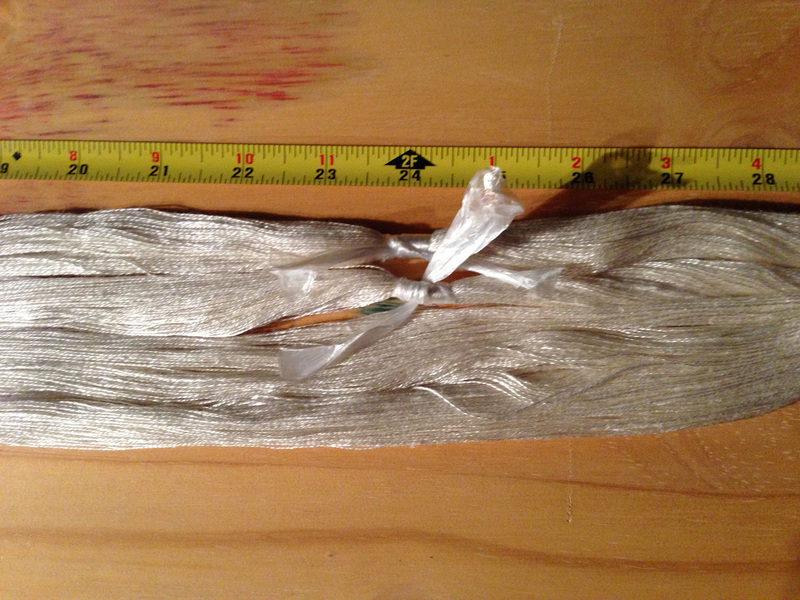 For smaller skeins it makes sense to use a knitted blank instead, but for larger amounts, skeinwinding is faster. In this particular case, I timed knitted-blank production at six minutes/blank and skeinwinding at three minutes/skein, so it would take twice as long to knit the blanks as to wind the skeins. Plus extra wear and tear on my body from knitting 300 rows per blank, for forty-five blanks! So I’m winding skeins instead. So far I’ve wound fifteen of the forty-five skeins, so am well on my way. On the slate for the rest of the week is more prosaic stuff, like finishing the project for Handwoven and writing the accompanying articles. Also revising my lesson plan for the workshop I’ll be teaching in March, and writing up handouts to go with the workshop. I’ve taught it twice before, improving it each time. Hopefully this time will be the best yet! And, the kittens you’ve been waiting for! 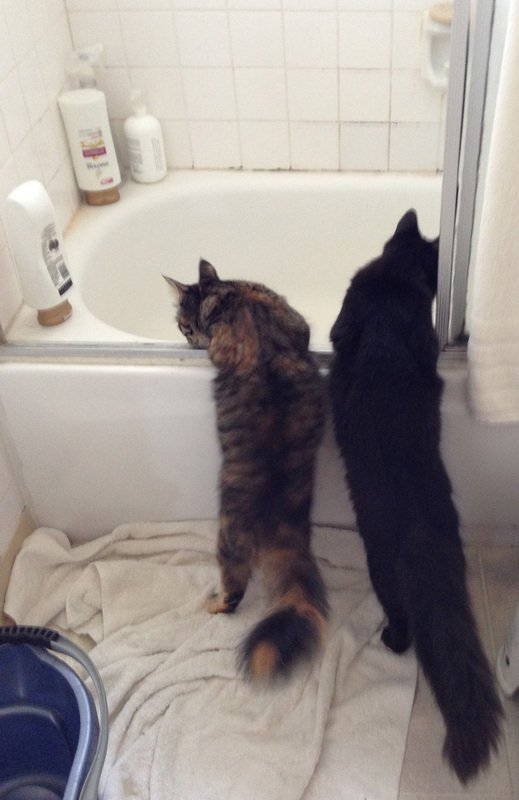 Here are Fritz and Tigress, getting their first glimpse of the bathtub. We had been keeping them out of it, but after Superkitten (aka Fritz) took a flying leap to land atop the glass door to the shower (only two inches wide – holy wow, he’s one amazing jumper), we decided it was safer just to let them in. So the moment we opened the door, two curious kittens rushed over to investigate. Because, you know, the bathtub is the most interesting place ever!